Kaisuke Tanasaki is not one of gaming's most well-known directors, but he oversaw some of the DS's most intriguing narrative-led titles in the form of Hotel Dusk: Room 215 and Another Code/Trace Memory. After developer Cing's closure in 2010, Tanasaki-san is back with some of the same team under Arc System Works to release Chase: Cold Case Investigations – Distant Memories. Whilst it's a little more restricted than previous games by Tanasaki-san, it manages to largely capture the same sense of charm, intrigue and mystery that permeated those retail releases on DS. As a short narrative experience (around two hours in length), Chase: Cold Case Investigations is a visual novel that focuses on two detectives, Shounosuke Nanase and Koto Amekura, who are part of a cold case unit within a metropolitan police department. 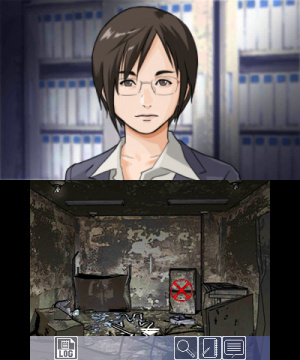 As the game explains in the introduction, a cold case is one which has been left unsolved due to a lack of substantial evidence. Primarily playing from the perspective of Shounosuke, it is up to the player to uncover the mystery behind a mysterious explosion at a hospital that occurred five years previously, under a new accusation that the person who snuffed it during the incident was murdered. Thus, your investigation begins. 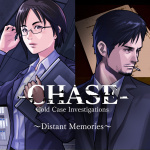 Make no mistake, Chase: Cold Case Investigations is quite a linear affair due to its evidently smaller budget. There isn't the option of exploration or point-and-click adventure mechanics found in previous Cing games. Instead, this title focuses largely on its narrative and keeps things set in Shounosuke and Koto's office. A large part of the story is delivered through interactive cutscenes and with a focus on interaction between characters, with proceedings moving at a leisurely pace. Even though there's no recorded dialogue, you can feel out the personalities of everyone you meet, especially the two leads. Shounosuke is a bit guarded and grizzled, but you get the sense there is quite a bit of empathy underneath the surface, even if you could make a drinking game based on how many cigarettes he lights up. Koto is more sparky and upbeat, allowing for a bit of friction - and occasional light humour - between the two. But it's mainly through solving and sleuthing that the game finds its interactivity. You enact detective procedures by examining different sources of information to drive the mystery further. Some of the more interesting moments involve looking at crime-scene photos and pinpointing interesting evidence with your stylus to gain a deeper understanding of the case at hand. The other main aspect of solving the case comes in the form of interviews with potential suspects. In order to get a clear picture, you'll interview several suspects and be given dialogue choices in order to get information out of them. There's an Interrogation Gauge that depletes with each wrong answer you give during an interview, and if it falls to zero then it's game over. Unfortunately it's the approach to these multiple choice segments that causes the game to fall a little short. Whilst the overarching narrative and characters are engaging, the choices you're required to make often lack depth. A little too often, choices are binary and come down to simply remembering the right information about a case (although there are some more emotional responses available at times). Occasionally it's plainly obvious to anyone what the right answer is. For example, there's one instance where you need to ask about someone's daughter and the only other option concerns a male character! And if you do get an answer wrong during an interrogation, you are often corrected by Koto and returned to the same question, rather than continuing on; for this reason the choices don't feel as dynamic as they could be. When the only penalty for a game over is starting again near the same spot, the stakes don't feel so high. Luckily the overarching narrative is interesting enough to keep you pushing forward. Seeing the same story being told from different perspectives maintains intrigue in the case, and suspicions in all suspects involved. There's also a touch of realism to proceedings as you're required to interview potential murderers multiple times and re-examine evidence in a new light. Although some of the narrative twists will be foreseen by those who have experience of detective stories, there are a few curveballs included as well. By the end of the game, it's clear that this is meant to be part of something larger. Arc System Works have been smart in keeping a narrow focus on a singular case to begin with; it's likely that if the title succeeds commercially, we could see further sleuthing instalments involving Shounosuke and Koto. Let's hope they get the chance to follow up their leads a little further. 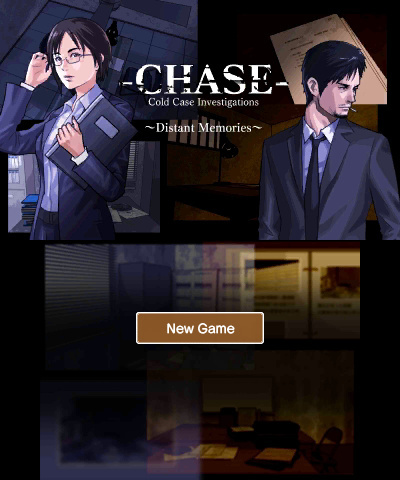 Although its branching narrative system could have more depth, Chase: Cold Case Investigations has an undeniable sense of charm and keeps players' attention through its characters, anime art style and subdued jazz-noir soundtrack. If the series is allowed to continue and introduce a deeper approach to multiple choice and interrogation, then we could see something truly special. Seeing as it ends with a cliffhanger I really hope we get more. I used the My Nintendo discount to get it. I don't know if I'll stop the newest Phoenix Wright after I'm done with case 3 and play through this game since it's short and then resume PW. I'm really liking Spirit of Justice but I'm only playing 30-60 minutes a day and I'd like to see what Chase is like as soon as possible. Yeah. £6 is an acceptable price for two chapters of this length and depth but not for a single chapter. Even though it was a visual novel, I just expected more to this than what we got. I disagree with the review about there being a sense of charm. It actually feels like a cut-down budget version of the charm we saw from Hotel Dusk. Shounosuke is a less appealing version of Kyle Hyde. Its okay to have a gritty tough no-nonsense character if they are written well, but Shounosuke isn't it. My advice is to just continue playing Spirit of Justice instead of bothering with this. And if you really want to, I would advise you to wait for a sale. I'll probably pick this up after finishing AA Spirit of Justice, which is shaping up to have one killer final case! Thoroughly pleased with the last AA in general. Not quite as challenging as the original installments, but much more narratively engaging than Dual Destinies for sure. I like Mystery type narratives so I'll give this a go. I bought it the other day but not played it yet. Oh my, for those curious, the beeping banner audio is what it sounds like when you go over the 3 second limit. That's some Quality Testing there. I recommend to anyone to use the 20 gold discount and buy the game if interested (you'll get 10 gold coins back by purchasing this game) or don't buy at all and wait for a full release. I sure enjoyed the game but I was expecting a bit more than 1 hour gameplay which wasn't very involving other than reading, memorizing and pointing out some clues I really hope this becomes a full game like Hotel Dusk! @Moon Just wait for a sale, could easily go for 40-50% off. It's not a bad deal, though. A movie is at least 2-3 times that and can last less than 2. Games should last longer than the length of a movie for the same cost. 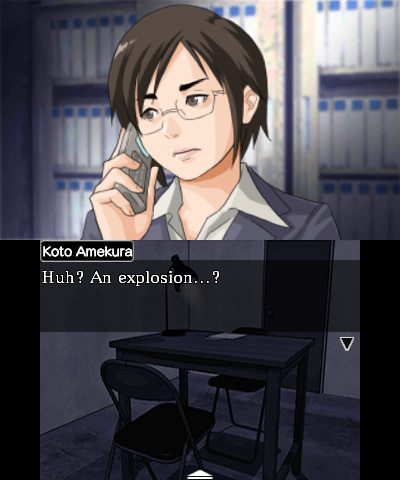 Especially since the scene never changes from Shounosuke's office. Definitely going to pick this up in the future! I have always been surprised Japanaese games show characters that smoke. American TV is completely absent of smokers at least broadcast tv. Well at least Japanese does not edit out the characters smoking. Although I wonder how much of a turn off for many Americans players seeing characters smoking in video games is. I know I am always a bit surprised. @Eisenbolan I've still seen CN and Boomerang show old tom & jerry and loony tunes episodes where you see smoking, guns, suicide, and the usual violence. As well as flashing lights, patterns, though that's a different matter. Thank goodness, it's not over-localised like the "Phoenix Wright" or "Jake Hunter" games. I will wait for a sale with a 2hr play through. Still looks interesting! I just picked up the new Ace Attorney game. So I'll be on that for a while plus the DLC. Once I get done with that I may give this a shot. Hngggh, want this! Hopefully will get some cash in before the 27th.. Anyone know why they didn't just use Kyle Hyde for this game? @Eisenbolan it was MUCH more common on tv in previous decades. @JBDD Even through the game was made by ex-CINQ developers who worked on Hotel Dusk, Aksys has no right to use the Kyle Hyde character despite CINQ being no more. Probably a lot of expensive legal issues to contend with had they wanted to use Kyle Hyde. So its much simpler to make up a new character in the Hotel Dusk art style that reminds people of Kyle Hyde. @Bass_X0 It's Cing, not Cinq. @Bass_X0 Ah, I see.. A pity. Played and loved Hotel Dusk and got kinda attached to the character.. Hopefully not-Kyle is a compelling character in his own right. @Eisenbolan really? I've played alot of western games where people smoke and drinks, same for tv shows, so I did not know that might be a concern. @Bass_X0 I think Kyle Hyde is in the game. Kenji Hisada has a very similar story to him. They even have the same first letter in their name. It was probably their way to say goodbye to this character. Considering that the protagonists are really annoying I found the 2 hours I've pumped into this game worthwhile. I really love the noir style, and the cliffhanger at the end really wet my appetite, so hopefully case two (part two) will follow this up. Especially considering that Kenji has a secret too, not explained during this short ride. @Yalaa I'm assuming this is only for the PAL region? Because us NTSC users don't have it on My Nintendo. Eh, I'm fine with paying full price considering the creator's games are kinda obscure. I picked it up because I was going on a road trip but I didn't wind up touching it. I bought it, sounds like the perfect game to curl up with on a wet and rainy Sunday afternoon. I hope they announce a Part Two. I am playing Hotel Dusk currently and I keep on playing despite its drab-ness just to find out at the end if it was all worth it. There's an element of challenge in that if you choose wrong answers, it will lead you to a Game Over screen and have to restart the chapter from the beginning so you have to be careful with your choices. 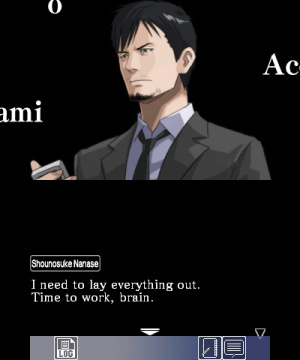 I want Jake Hunter 3DS, as well. The more detective games, the better. By the way, it's a novel game. Nothing exceptional here, you can like it if you like little stories. The game could be OK (not even good) without some nonsense-moments, but with the current script it made me really angry. 1/10. Two hours? That's a really generous estimate you guys gave, NintendoLife. I'm just going to start by saying I LOVED Cing's work. Trace Memory, Hotel Dusk- I even got an import copy of Last Window when Nintendo of America decided to be too stupid to allow it to be localized here. Cing is hands down my favorite developer. But this game isn't going to give you two hours of playtime, especially if you're a fast reader. If you read it slowly, you're going to get an hour, MAX. Myself? I finished the whole thing in around 45 minutes. 45 MINUTES. I thought this was like Phoenix Wright, where you get one teaser case and it preps you for the rest of the game. I had no idea that this WAS the whole game! When the credits rolled and I got dumped back to the title screen, I kept looking for the "continue next chapter" button, because I couldn't believe that this was all I got. I still am a bit in shock, to be honest. Finished the game. It wasn't anything special but I'm still glad I tried it out. The visuals and music are a lot like Hotel Dusk but the gameplay differs. The user input is barely there so it's much more like reading a short novel than playing a game. I know it's a visual novel but other visual novels I've played have had much more to do. Branching paths, puzzles, etc. The ending didn't surprise me but I'm ready for part 2. Well... I took my time to read and to not skip the "animations" but it only lived for 75 to 90 minutes. I know the price isn't high, but it isn't cheap either for this duration and what it offers: far less than a PC visual novel game's chapter. The way it ends helps to make it insufferable too, reducing to zero everything "you" made. Is the use f "memories" in the subtitle of the game a way to link it to the several Another Code and Hotel Dusk games? @ollietaro If you never need to restart because of a game over, the game offers you the "full end scene" if I remember it right. @Bass_X0 I agree, but it's much cheaper than a movie, lol. You can beat the game in 45 minutes or so. 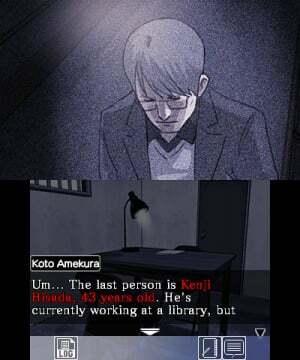 Great detective game right? I love the artstyle but it felt too generic and simple for me. You just have to remember the info given to you and answer correctly, not much thinking involved. It also lacks the charm of Hotel Dusk's characters.